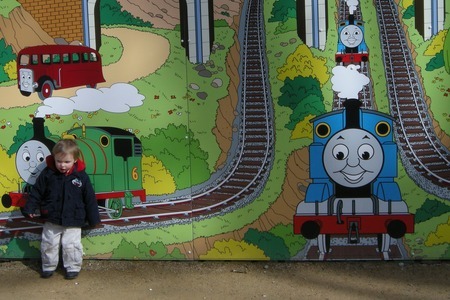 I took my 2 year old son on another trip to see Thomas the Tank engine at Thomas Land, Drayton Manor Park during the opening weekend for the start of the theme park season. It's not been long since we last there as we went to the Christmas Magic at Thomasland during the Christmas holidays. At Christmas the rest of the Theme Park is closed with only Thomasland and a couple of other rides running. This time the full park was open so we tried to make the most of the entire park and not just Thomasland. As it was just me and my toddler son (Oliver) it would have been much cheaper to have gone during mid-week, but I was specifically looking for a day out at the weekend. To their credit the staff member on the ticket booth did suggest that it would be cheaper to go mid-week if we went again with a toddler. 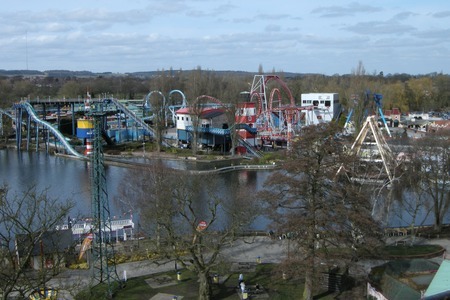 Drayton Manor park is not expensive compared with other adult theme parks, but it is more expensive than a children's theme park such as Gulliver's Kingdom and Wicksteed Park, although there is much more on offer at Drayton Manor. One good thing about Drayton Manor is that they don't charge for under 4's so this time the price was comparable with the children's theme parks anyway. We visited all the usual attractions in the Thomasland area: Thomas the Tank Engine, Rosie, Harold the helicopter, Jeremy jet plane, the Diesels, the Sodor vintage cars, Crazy Bertie Bus and Lady and the circus train. We had a great time on these alone and my son really enjoyed seeing the characters out of the TV programme. We also visited the Spencer play area and the farm area. The Thomas Experience was closed - which normally shows the original set from the TV series (static display) see the photo gallery from our Christmas visit to get a glimpse of the Thomas the Tank Engine Exhibition. This could have been enough to fill a full day on its own, but being early in the season and arriving early meant that the queues were short and we had time to go on a few more rides. Avoiding the usual fast food places we went to the self-service restaurant at the top end of the park. The food was good quality (typical self-service counter standard) and reasonably priced. The baby changing at the restaurant was a bit basic, just a bench, but did the job. There is a "Super Loo" next door, but we just used the one in the restaurant. 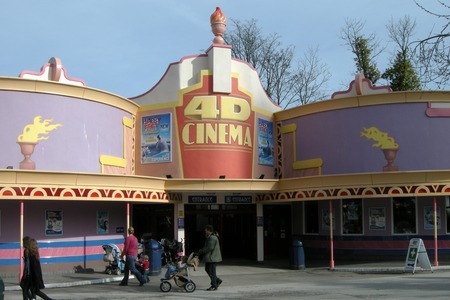 When we visited at Christmas we saw the special Christmas film at the 4D cinema. The show was okay, but was not as good as I'd hoped for. This time Happy Feet was on which is a 20 minute film featuring the famous penguin. My son didn't wear the 3D glasses, so most of the scenes will have looked a bit blurry for him, but we both enjoyed the film. Very cool [pun intended]! I'd not seen Happy Feet before, but I'm now looking to get it on DVD. We then went on a few of the other rides in the Drayton Manor Park. With no-one else to look after my son I didn't get to go on any of my favourites (ShockWave, G-Force, Maelstrom or Apocalypse), but there were lots of other rides that we could enjoy together. We went to the Wild West Shoot Out, which was very good. Effectively a tin-can alley in a moving car. We then went on the big wheel, the Excalibur boat ride and the Drayton Queen Boat ride. Seeing the Buffalo Roller Coaster my son said that he wanted to go on that. I wasn't too sure whether he would like it as it is quite a fast ride, but I took him on after seeing other young children going on. He loved it! 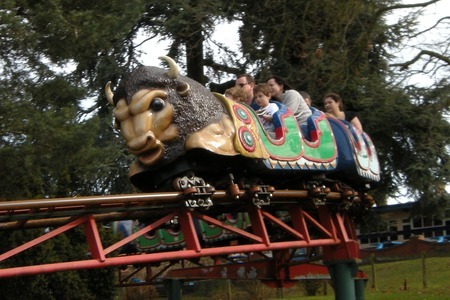 The troublesome trucks roller coaster in Thomasland has a minimum height requirement of 0.9m, so if your child is too small for that ride then you can use the buffalo coaster as an alternative. We also went on the Wild Canyon water ride. He enjoyed the ride, but I'm not so sure he liked getting wet. I was hoping to get a photo from the ride camera, but the boat turned to face the wrong direction. I suggested going on again but Oliver wasn't so keen. He referred to it as the splash boat and seamed to be quite happy about it. He's mentioned it a lot over the last few days since our visit. We then went on the Polperro Express Train, followed by a ride on the Pirate Adventure boat ride. I'd been on this ride before, but had forgotten how gruesome some of the animated figures are. I guess Oliver was too young to understand and he didn't seam to be bothered about it, but I don't think I'd take him on it again until he's a bit older. Finally we had one last visit to Thomasland for a second go on the Crazy Bertie Bus before we went home. Unfortunately we didn't get time to visit the zoo this time, so that will have to go on our to-do list for our next visit. Exhausted from a busy day it didn't take long for Oliver to fall asleep in the car on the way home. We had a great day at Drayton Manor. In the past we have spent more time at Thomasland, but there are lots more rides in the rest of the park and it meant that I got to enjoy a few rides as well. We've been several times before and no doubt will again lots in the future. We are both looking forward to whenever our next visit is.